It’s undoubtedly true that basing your business around customer service always pays off. These days, we’ve been witnessing many amazing stories of companies that made customer service a key pillar of their business and eventually the face of their brand. Have you ever asked yourself if your team can learn from these successful professionals, and what you can do to delight your customers just as well? In two previous blog posts I outlined some important aspects contributing to the success of the world best customer service teams, and suggested how you can learn from them. This is the last blog post in the series. If you have missed my previous posts on the topic, you can catch up on them here and here. Many businesses just underestimate how important customer service role is. For them, it typically stands for a job that can be easily fulfilled by the newest and greenest employees armed with scripts to work on. The best companies take quite the opposite approach and emphasize that customer service is more than a department, putting it at the very top of everything they do. Make it your mission like Southwest Airlines: On their website, one of the most well-known airlines in the US describes its mission as “a customer service company that happens to fly airplanes (on schedule, with personality and perks)”. It’s that simple. For Southwest, dedication to customer service is more important than profit. Every employee is taught from day one to adhere to company values and commitment to high-quality customer service, and do whatever necessary to satisfy the customer. As John Tschhol puts it in his article, they’ve known for years that customer service doesn’t cost… it pays! Empowering your customer service team reps to take decisions on their own is critical for customer satisfaction. It’s more than just being able to turn a potentially frustrating situation into a positive customer interaction on the spot. Rather, it’s about mastering the mindset that gets your team more engaged and motivated to do the right thing for the customer, any time, in any situation. By creating a culture where employees are encouraged to think out of the box and actively put ideas forward, you can help your business innovate and grow. People perform their job to the best of their ability when they enjoy it. This can be barely achieved when employees are tied down by hand and foot by scripted scenarios and red tape. Conversely, the most impressive stories in customer service usually involve situations where service reps flexibly use their creativity and unique personality to serve their customers right. Go the second mile like Chick-fil-A: Chick-fil-A’s commitment to exceptional customer service is best reflected by its second-mile service standard: If you want to make a difference, step over the line and into that second mile, because magical things happen there. Employees are encouraged to use their imagination and creativity to go above and beyond for surprising, fun and rewarding customer experiences. This practice of giving a little something extra to its customers lets Chick-fil-A make a huge difference and become a real outlier in the fast food industry. And, obviously, Chick-fil-A’s 61,000 employees really love and enjoy their work, as the company is reported to maintain an unusually low turnover rate at a third of the industry average. 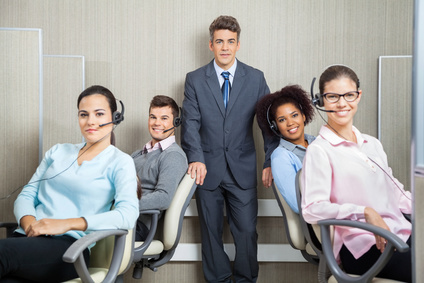 Employee commitment to customer service excellence begins with communicating the vision throughout the organization and maintaining it through teamwork. In great work environments, the core is a vibrant team spirit achieved through sharing company values and working together to accomplish a common mission. As an old saying goes, teamwork divides the task and multiplies the success. Foster teamwork like Ritz-Carlton: The world’s leading hotel chain is famous for its daily line-up meetings habit that takes about 15 minutes at the beginning of each shift. It is intended to focus on one aspect of company’s Gold Standards, let employees share related “wow” stories and inspire a winning attitude. It is also considered as the opportunity to reconnect each employee with their team, purpose, and mission before they start their day. Hearing how your colleagues are living the culture inspires you to do likewise and helps foster a culture of customer service excellence, states the Ritz-Carlton Leadership Center blog. Have you tried any approaches described above to improve customer service at your business? Are there any other important factors I have not mentioned yet? What other steps does your company take to ensure great customer service? Please share your experience and insights. Julia is passionate about customer service excellence, and has more than ten years of experience as a Customer Service Representative. Julia is also a writer and blogger on topics related to customer experience, customer service innovation and live chat support service. This entry was posted in Articles and tagged customer service team building, world-class customer service. Bookmark the permalink.